Our ready made collection of wedding cakes are made to order. 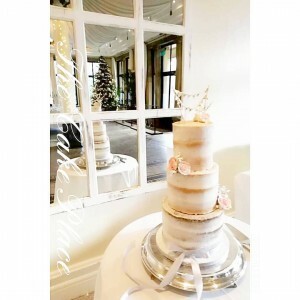 Our ready to order wedding cakes are made to order using our standard designs. Please contact us for availability. We usually require at least 1 month notice for wedding cakes. Our wedding cakes are approx. 5” deep (subject to design) and contain 3 perfect layers of cake with 2 generous layers of filling. Iced cakes are then coated in white chocolate ganache before covering with a fine layer of quality fondant icing. A tall , sleek design topped with a hand made rose. 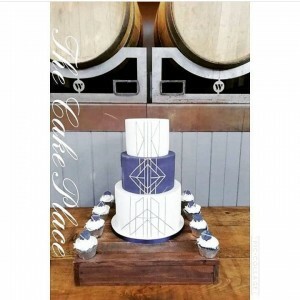 top tier features a fan , middle tier handmade Art Deco edible Cake Lace & the bottom tier with a sleek swag design. 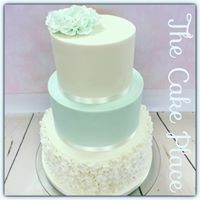 3 tiers of sponge cake available in a variety of flavours. Decorated with a rich ivory sugar paste and light ivory details. Cake in picture , 6” 8” & 10”. Romantic 3 tier with ruffle bottom. 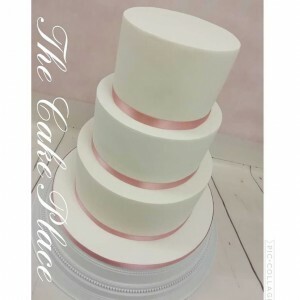 A beautiful, subtle, romantic style, with a bottom tier adorned with ruffles, a hint of colour in the middle tier topped with a sleek white cake , and a handmade flower. Beautiful 3 tiered cake with marble top and bottom tier , with a white middle tier with edible white lace. Hand made flowers as an optional extra. 3 tier bold statement cake. With a deep coloured middle tier , and thin sleek straight lines running through your cake. it is bound to make a statement ! 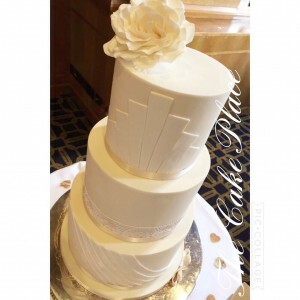 A simply stunning design with a sleek top tier and a quilted bottom tier. 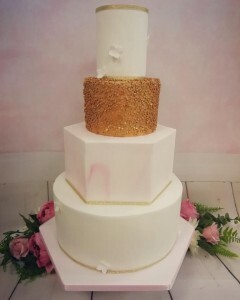 2 handmade roses finish this cake off beautifully. 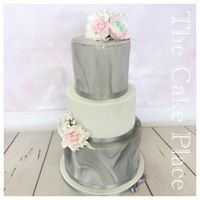 4” top tier, with edible cake lace , 6” airbrushed confetti tier , subtle marbled 8” cake in top of a 12” suitcase. adorned with handmade peonies & roses, with delicious handmade macarons. 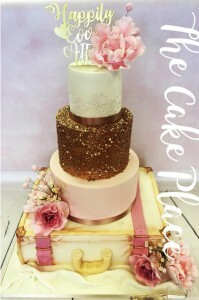 lovely tall 4 tier cake , with a hexagonal marbled tier and a confetti rose gold middle tier. If you would like , no fuss & no frills cake, a cake you would like your florist to dress with fresh flowers or you would like to decorate your own cake with out the stress of the baking and covering , this is the cake for you. Available in white or ivory. Colour of ribbon can be changed to complement colour scheme. Collection from our shop during opening times is free, however a date and time for collection will be mutually agreed. A late payment fee is due if the cake is collected outside our opening times. 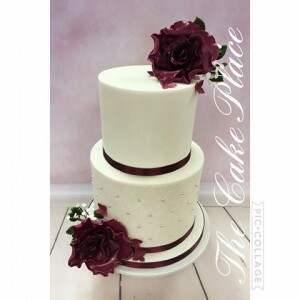 Your cake can be stacked ready to be set out at your venue, or you can have your cakes individually boxed ready for transport, to be assembled at your venue. This will depend on your chosen design & will discussed during the ordering process. Delivery charges do apply, these will depend on where your venue is & what day & time your cake needs to be delivered. this will be discussed during the ordering process however examples of prices are listed below.